A Hoover woman, Tracy C., thinks that Chris Davis was “clearly out of bounds.” Even though he wasn’t. Even though that shadow beneath Davis’ holy foot in the (Photoshopped?) photo she used for the Change.org petition she started that asks the SEC and NCAA to “put together an overtime play for Auburn and Alabama” means that said holy foot was in the air and not out of bounds. The millions who have marveled at The Run? You’re all morons! HE WAS CLEARLY OUT OF BOUNDS. Chris Davis from Auburn was clearly out of bounds in running the missed field goal back for a touchdown in the 2013 Iron Bowl. There was way to much riding on this game for that to have been missed- a SEC Championship and National Championship. I think they should put together an overtime play for Auburn and Alabama. Yes, I know how impossible that sounds and how much trouble it will be BUT sometimes you have to make wrongs RIGHT and with so much riding on that game the SEC and NCAA needs to make it right for the players, university, fans, coaches, SEC and SPORTS in general. And if they don’t like the hassel then go out and make sure your employees, the refs, are not making such HUGE mistakes. And the refs needs to be punished for not even reviewing the play because it wasn’t even close- he was CLEARLY out of bounds. Its not fair to say that this is over and overtime can’t be played now just because of how much trouble this would be to put together. It was wrong….and you need to make it right regardless of the hassel. 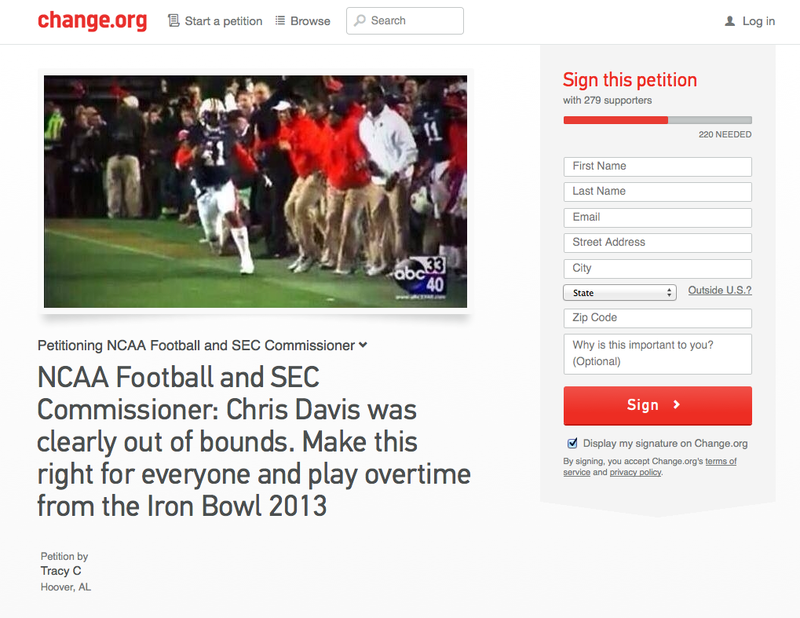 SEC and NCAA- do the right thing and make this right for everyone involved!! Let’s all sign it and see what happens! UPDATE: Here’s a non-Photoshopped GIF (via commenter Saudia). I’m sure she’s the pride of the UAT English Department – she misspelled “hassle” twice. Is this the same bammer Hoover woman that shot and killed the other bama fan lady?